The bathrobe was also a delight to use, made of incredibly comfortable terry cloth. It's great to lounge around in on weekends too. TIP: Keep lips smooth by using NIVEA's Lip Butter before going to the shower. The shower steam will help moisturize lips and afterwards, gently exfoliate with a soft toothbrush. 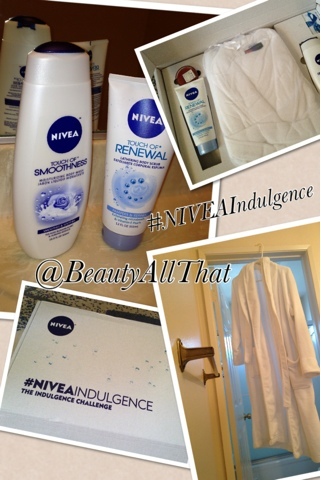 Remember to tweet #NIVEAINDULGENCE and @BeautyAllThat to win Touch of Reveal and Touch of Smoothness by June 30th!